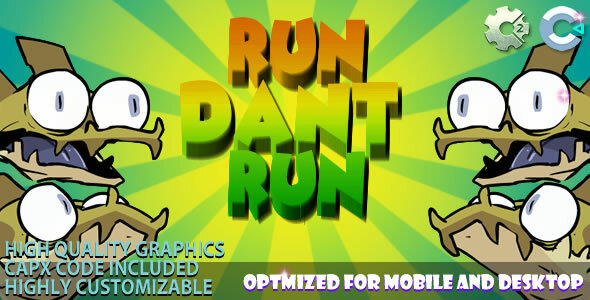 Run Dant Run (C2/C3/HTML5) Game! Run as high as you can, collecting all the objects on your way to score points, get the longest distance from the records. Each object collected increases the speed of the game making it more difficult. Avoid colliding with the skulls they can take a life out of you. Good luck, and good fun in overcoming your record. ◉ – Done with construct2. ◉ – Easy to edit. ◉ – Easy to export to Android and IOs. ◉ – You do not need programming knowledge to edit. ◉ – Touch, Keyboard supported. ◉ – Documentation included (index.html). ◉ – Files included as (.capx, .html, .png, .m4a, .ogg, .mp3).